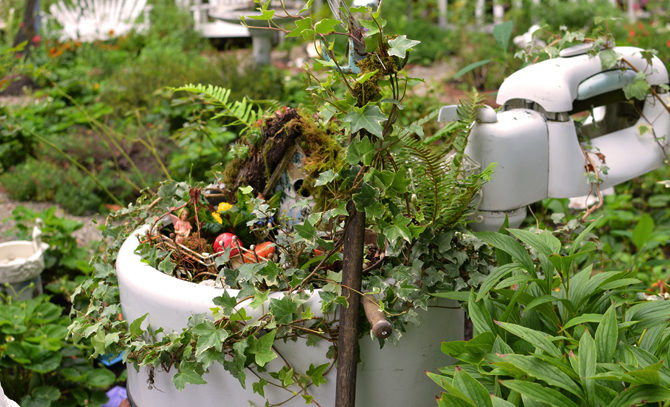 ' A Bit' of Earth - Marme's Garden Part 1 - Sisters, What! Our mother is talented in so many ways, but I think where she truly belongs is outside in her gardens. 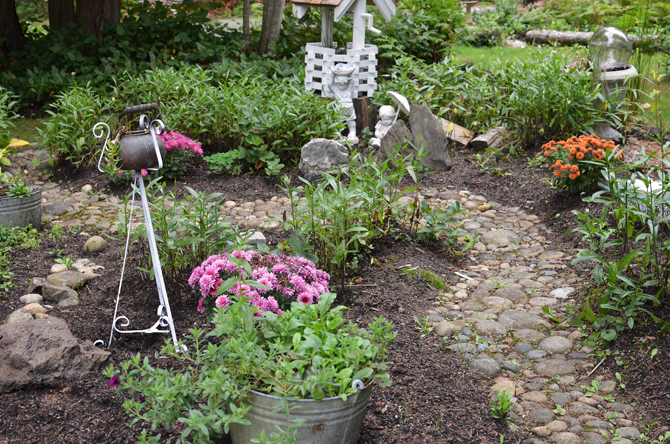 Growing up all of us girls have taken our turns at weeding and planting in these gardens. But none of us ever had the touch or the love that our dear mother does. 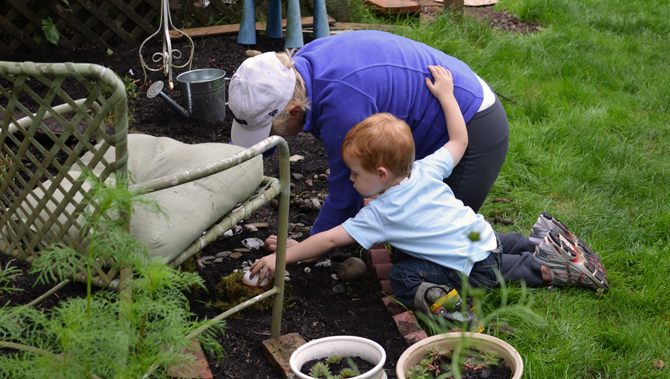 Although I sometimes didn't care to weed, I will always treasure the moments spent in the garden with my mother. I'm so happy that she is now sharing her passion with her grandchildren. 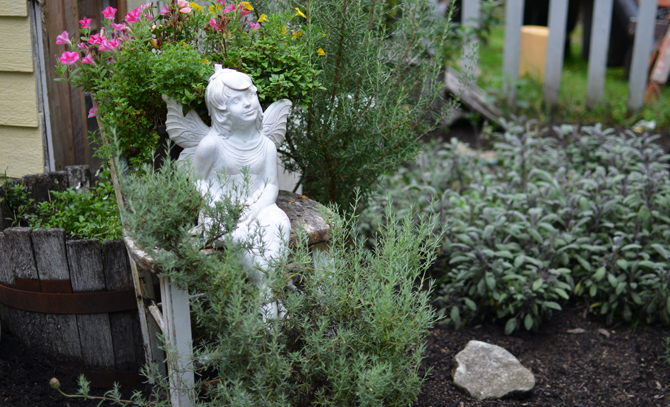 Her most recent addition to her gardens are fairies. 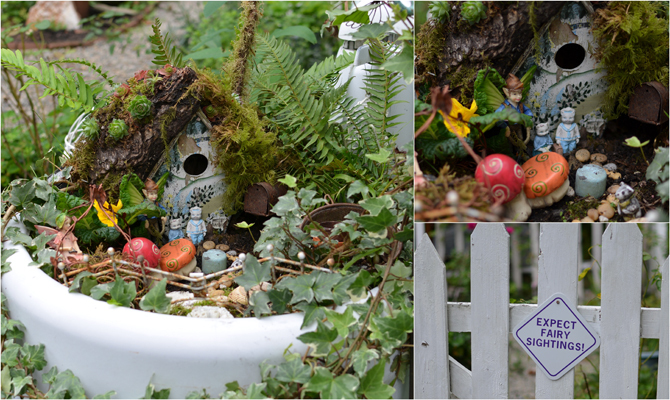 I'm not quite sure how they came to be, but my mom has slowly been building up their residence with the help of her grandchildren (particularly a granddaughter who LOVES fairies). Our little one spent at least 2 hours with my mom this past trip just walking around all the gardens and helping her fix up some of the fairy yards. The gardens are truly at their best during the spring and early summer months when the flowers are full bloom, but alas I only have pictures of them from last week. I suddenly had to use the bathroom and the wee little one woke up so I only took a few pictures (not like you really need to know those details). 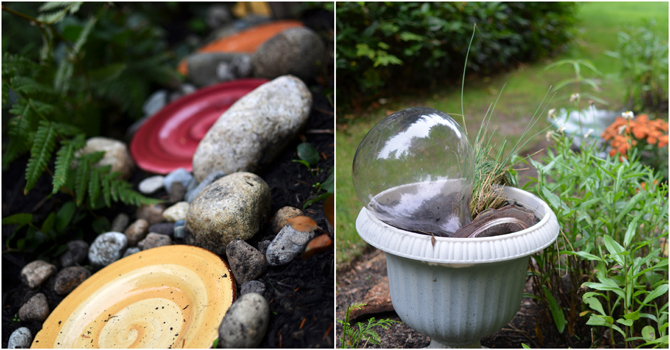 My mom loves to use antiques to decorate with in the gardens. I love the fairy sitting in the old chair above. Below happens to be my parents first washer before they got their first electronic. My mom still likes to tell us "I washed all your dirty diapers in there." Every time I see that old washer I say a prayer of thanks for modern washers and disposable diapers. I think it is definitely better suited to be the home of plants and fairies. Don't you think? 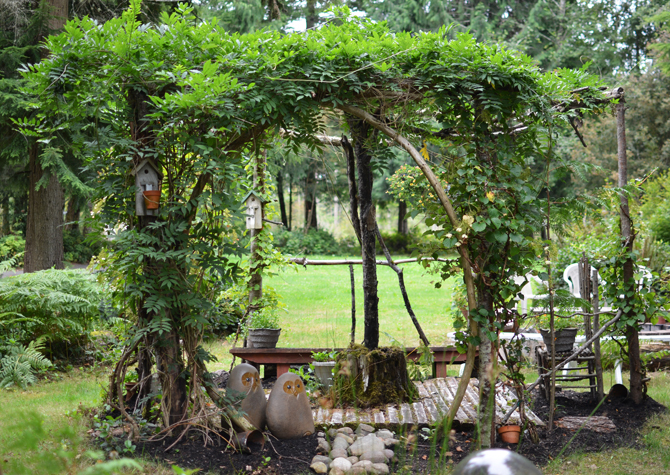 Below is a gazebo built by my dad a few years ago. Actually, the first one built in that spot was accidentally crushed by a fallen tree, but it has been rebuilt since. It's probably one of my favorite spots in the yard. Below: the beautiful curving rock path was built a long time ago by your's truly : ). It took forever, but my mom loved it so much when I started it that I got out of weeding for a few weekends as long as I was working on that path. I'm very proud of my garden path because it's the only thing that I've ever 'planted' that hasn't died (I don't have a green thumb at all). 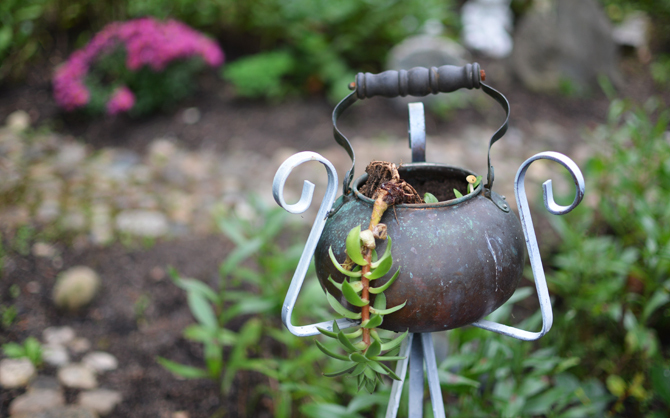 Who would have thought to use an old teapot as a planter? or how about some old colorful plates to liven things up?